“You don’t recycle glass? !” is a common exclamation from Missoula’s visitors and new residents. Trust me, we old-timers aren’t too happy about it either. While small-scale recycling and reuse programs are gaining a following, there is no question that Missoula has a glass problem. Missoula’s Zero by Fifty initiative calls for a significant waste reduction by 2050 and, if we are to meet that goal, some big changes need to be made in how our city deals with glass. According to a 2014 EPA study, glass currently makes up 4.5% of the waste generated in the United States annually. That’s 11.43 million tons of glass waste. After recycling (at a national rate of about 5%), over 10.5 million tons of glass was destined for U.S. landfills in 2013. Landfills are the third largest emitter of methane in the United States according to the EPA. Given the high energy costs and greenhouse gas emissions associated with the extraction and transportation of resources necessary to satiate the nation’s current level of consumption, single-use items have a significant impact on driving climate change. Glass doesn’t need to be single use. Made of sand, silica, limestone, and cullet (a term for recycled glass used in the production of new glass products), glass is endlessly recyclable. It doesn’t lose quality in the recycling process (here’s looking at you plastic). So why don’t we have a large-scale recycling program in Missoula? The closest glass recycling markets are in Seattle and Denver. Because Montana has a low population and density, we don’t generate enough glass for it to be economical for pickup and transport. 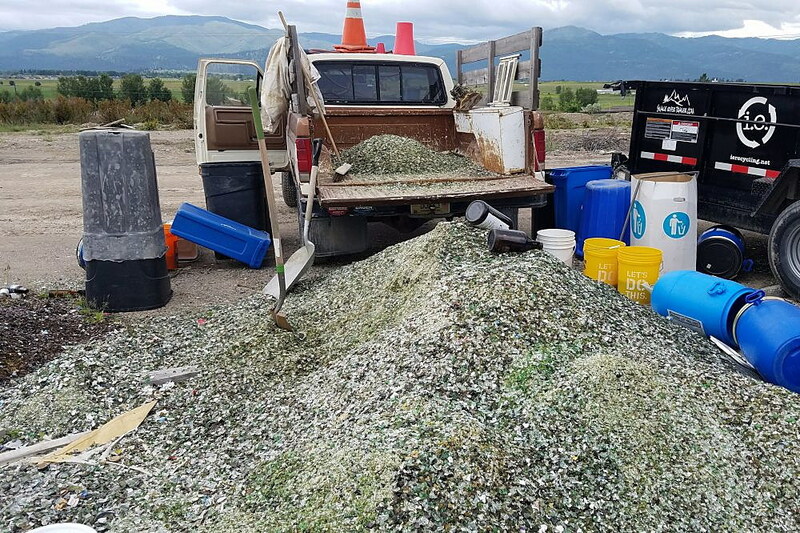 Target used to offer a glass recycling program in their Missoula store, shipping glass to recycling facilities in larger cities in trucks left empty after their deliveries. This program ended 2016 due to issues of contamination. If one jar or bottle in a load was contaminated, the entire load was taken to the landfill. The issue of contamination is exacerbated in single-sort recycling systems, which also amplify the safety hazards of broken glass. Together these issues serve as major reasons for why many residential recycling services refuse to accept glass. Because the cost of producing new glass is relatively low, and the ingredients are readily available domestically, economic benefits do not incentivize implementing glass recycling programs. There are currently a handful of programs in Missoula that can help consumers keep their glass from ending up in the landfill. I.E. Recycling, a small recycling company that has been collecting glass for pulverizing and reuse, was recently taken over by a new group called Recycling Works Inc. Recycling Works is planning to offer curbside glass pickup for jars and bottles later this spring or summer. This glass could be used locally or sent out-of-state to be pulverized into glass aggregate. Aggregate is a form of crushed glass that can be utilized in landscaping, roads, and to make building materials like fiberglass. While glass recycling is still extremely limited in Missoula, small businesses in town are pioneering glass reuse programs to keep bottles in-state and out of the landfill. Perhaps the most innovative of these programs is Bayern Brewing. Basing their model on breweries in Germany (where there is a government-mandated reuse program), Bayern purchased their own bottle washer. With a capacity of 5,000 bottles per hour, Bayern’s bottle washer allows them to collect and re-use post-consumer bottles. To incentivize their program, they offer 5 cents per bottle returned. Dubbed “virgin plus one” by their head brewer, Bayern’s bottle washing program is the first of its kind in the region and has allowed them to build relationships with breweries both in Montana and the Pacific Northwest. Though building the bottle-washing infrastructure was a significant cost and a risk as a new type of program in the United States, Bayern is now able to use 80% used bottles in their facility, helping them save money and achieve their goal of environmental sustainability. While Bayern’s bottle-washing program is unique in this town, other breweries and taprooms around Missoula offer glass reuse through growler programs, and the Good Food Store accepts glass jars for use in their bulk section. Groups such as the Missoula Urban Demonstration Project have begun utilizing glass aggregate projects in landscaping and sidewalks, and the City of Missoula has proposed experimenting with aggregate on a larger scale as a part of future road building projects. While these initiatives offer critical small-scale opportunities to keep glass out of the landfill, more work must be done in order to meet Missoula’s goal of zero waste by 2050. Through a combination of innovative business models, government programs that utilize glass aggregate for infrastructure projects like roads, and an engaged community that refuses to accept glass as a single-use product, we can achieve these goals. Sophie Frank, Sarah Lundquist, Olivia Leeder and Rose Bear Don’t Walk are graduate students from the University of Montana Environmental Studies Program. Climate Smart Missoula will be hosting Zero by 50 meetups in March 2019 at Imagine Nation Brewing Co. and glass will be on the agenda. Meetups are open to the public and all community members are invited to come learn more, meet other people working on this issue, and be a part of the solution. This Sustainable Missoula column is brought to you – via the Missoula Current – every Friday by Climate Smart Missoula and Home ReSource. Happy Holidays All! There are many more conservation events for the up month and 2019 HERE.